I believe that everyone does their best given the context and environment at hand. I subscribe to Deming’s views that it is the organisation as a system, not the people working in the system that determines the organisation’s performance. The other view is that the people, not the process or the organistation, is the source of low performance. Due to the inherent complexity and variability of product development it is often difficult that the scope, details, or effort commitments estimates are certain. When things fall behind schedule (or finish ahead of schedule for that matter), it assumes that the original plan was correct in the first place, but this is often not the case. Plans often over-simplify the complexity of human interactions and creativity. Many of the challenges faced by teams today isn’t necessarily related to technology but can be described as a social problem – product development teams is a complex adaptive system that requires collaborative actions and shows complex behaviour as it adapts in and evolves with a changing environment. Option One of adding additional people may make things later as described in The Mythical Man-Month Is Not A Myth. This option is also has budgetary and financial constraints and managers are reluctant to go down this path. So when there is a performance gap, there is pressure for managers to close this gap to meet the original commitments by pressuring people to spend more time and energy doing work by working harder often in the form of overtime (Option Two). This is played for an apparent short-term win. This quick-fix reaction results in shortcuts which have a relatively long-delayed and indirect impact – it may be sometime before the decline in performance or capability is known. This is one way how technical debt occurs and requires more effort to maintain a level of performance. This technical debt often never gets rectified as managers deal with the next performance gap problem, and things get worse reinforcing the downward spiral. This option is a popular strategy as it solves today’s problems and meets the immediate KPIs. The Third Option is improve performance through investment in training, applying agile and lean-thinking strategy of removing waste to improve the flow of value and experimenting with new ideas. Time spent on improving the capability of a process typically yields the more enduring change 1. An hour spent working produces an extra hour’s worth of output, while an hour spent on improvement may improve the productivity of every subsequent hour dedicated to product development. Some overtime work may be justified but don’t rely on constant overtime to salvage a plan. 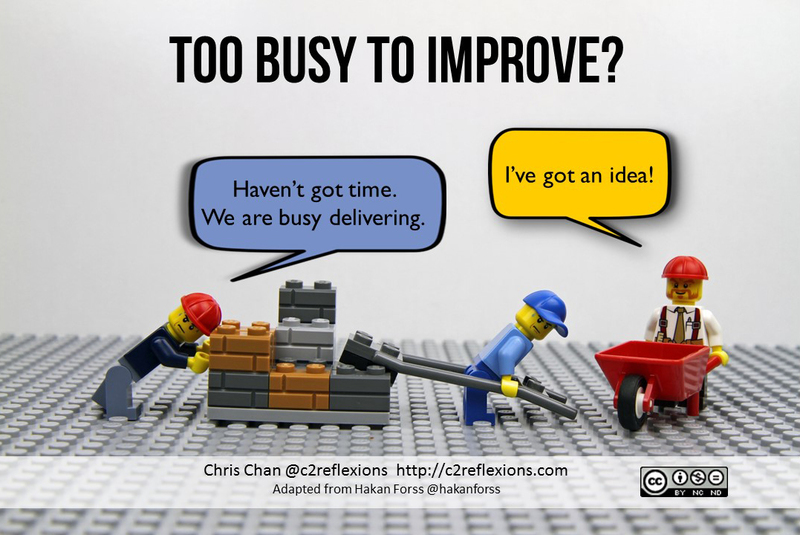 When the focus is constantly on production work people are often “too busy delivering”, and working overtime and harder quickly becomes routine, we have no time to improve or learn. Capability starts to decay and as a result, the performance gaps increases forcing the need for heroic efforts (that are rewarded) and people to work harder and longer hours which takes them further away from improvement. This is sometimes called being in a constant “fire-fighting” or reactive mode. One way to improve is to do regular retrospectives and operation reviews and then spend some time on the identified improvement activities. Kaizen, the Japanese word for continuous improvement, was popularised by the Toyota Production System. The culture of Kaizen is one of the reasons why Toyota has been more successful than many of the Western firms. Kaizen is about making small improvements continuously, so we can get 1% better every day. Just like compound interest on your savings account, overtime these 1% improvements can provide significant performance gains. As the performance gap falls, workers have even more time to devote to improvement, creating a virtuous cycle of improved capability and increasing attention to improvement. However, there sometimes can be a delay before the benefits from the improvement efforts will be realised, so you need to have a strategic view and an emphasis of investing in improvements. Treat each improvement activity as an experiment and learn from your mistakes. 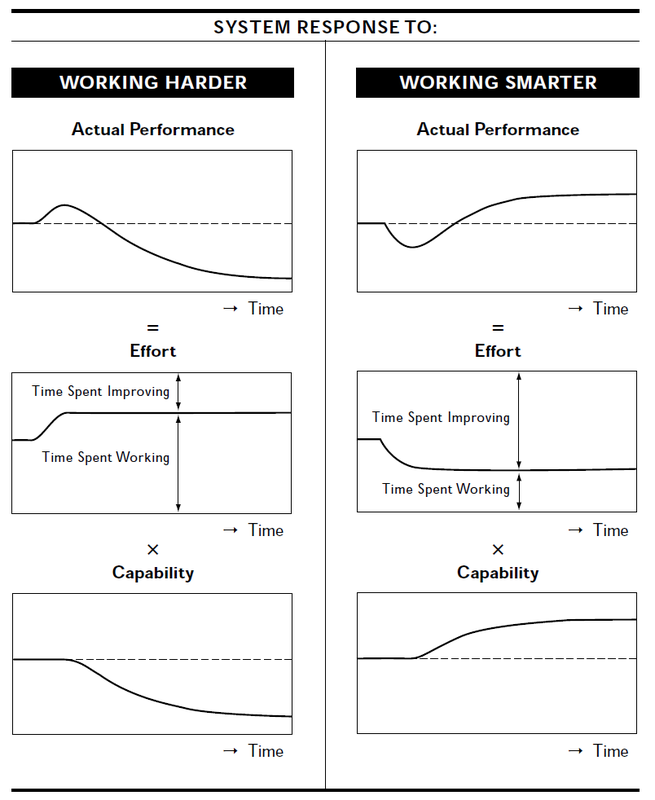 As illustrated below, working harder results in an immediate performance impact at the expense of improvement work but has a delayed capability trade-off in the long run. Whilst working smarter requires some investment in improvement that will require a short-term negative performance impact before things improve but has a longer lasting productivity gain. In reality, both of these continuously reinforce each other with each decision loop either having a virtuous cycle of reinforcing the performance curve positively (working smarter) or a vicious cycle lowering performance (working harder). Which one will you choose? This image has been adapted from Hakan Forss’ work. 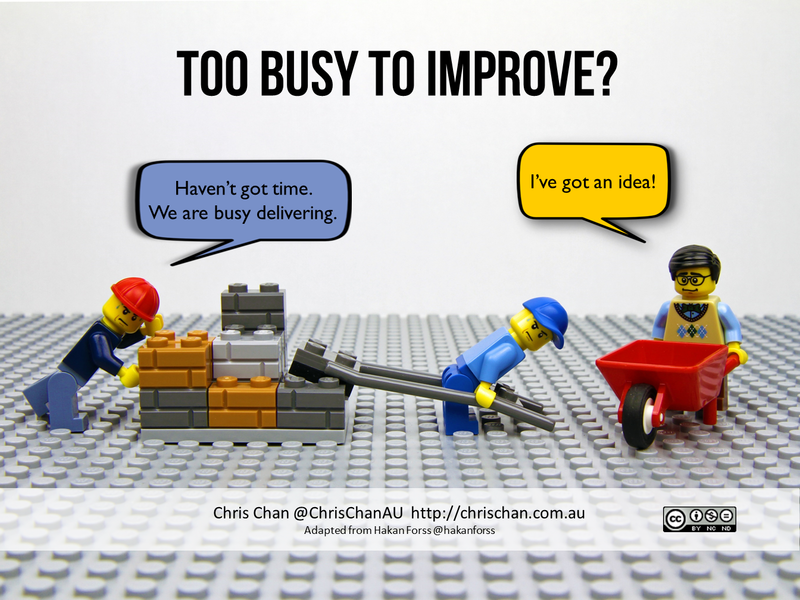 His ‘Too Busy To Improve’ image is not free to use so I have adapted his image which can be shared under the Creative Commons Attribution-NonCommercial-NoDerivatives 4.0 International license. Whilst this image is not as evident as Hakan Forss’, it hopefully still convey’s the same theme. You may share my image but you cannot create a derivative of it to respect Hakan Forss’ intellectual property. I would like to thank Hakan Forss for allowing me to adapt his work.